We’ve got just a couple days to watch 24 on Netflix! Read below! 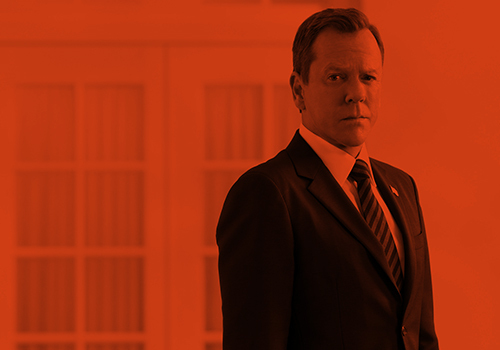 Tick, tick, tick: Netflix users have only about a week to watch Fox’s “24,” the real-time thriller starring Kiefer Sutherland, before the series is removed from the streaming service in the U.S.
Netflix’s rights to “24″ — 202 episodes in all — expire April 1. That comes a little more than a month before Fox is set to bring Sutherland’s superagent Jack Bauer back to TV with “24: Live Another Day,” an event series set to bow May 5 with a two-hour special. But Netflix’s loss will be Amazon’s gain, as the online retailer will continue to offer the past seasons of ”24″ to members of its Prime Instant Video service after April 1, letting fans binge-watch before the premiere of the new season on TV. Amazon first added “24″ to Prime Instant Video through a Fox deal announced in September 2011. An Amazon exclusive SVOD rights deal for “24″ would follow other pacts in that vein, as the Internet retailing giant builds a more robust lineup to take on Netflix in the category. Amazon recently reached a new deal with 20th Century Fox Television for multiple shows and, as part of that, FX series “The Americans” became available exclusively to Prime customers Feb. 6 — before season two of the Cold War-era thriller debuted Feb. 26 on the cabler. In addition, under Amazon’s deal with NBCUniversal, season one of NBC’s “Hannibal” became available on Prime Instant Video about a month before that show’s second run returned to the Peacock. And Amazon’s pact with BBC Worldwide North America made season one of supernatural thriller “Orphan Black” exclusively available on the SVOD service ahead of that show’s sophomore debut on BBC America. A Netflix rep confirmed that “24″ will roll off the streaming service April 1, but declined to provide specifics of its licensing deal with the studio. Netflix will continue to offer DVD rentals of “24″ through its separate DVD-by-mail subscription service. The past seasons of “24″ also will be available for purchase on electronic sell-through services including Amazon Instant Video and Apple iTunes. Amazon this month announced that it is raising the price of its Prime free-shipping program for U.S. members, from $79 to $99 per year. But the company has said rising content-licensing costs for Prime Instant Video did not figure into that price hike. This entry was posted by Courtney on Thursday, March 27th, 2014 at 9:20 pm. It is filed under 24. You can follow any responses to this entry through the Comments Feed.